SportChamps is a great fantasy sports betting platform made exclusively for the Australian punters. It is a direct punter on punter betting offering several cool promos, including the $50 bonus that you can get with the SportChamps referral code. What can I get with the SportChamps referral code? In order to claim the bonus, you need to follow this simple step-by-step procedure carefully. The welcome bonus is pretty simple and straightforward – all you need to do is make an initial deposit of $50, and SportChamps will automatically fill your balance with another $50 for you to enjoy. There are two additional promos that this astonishing fantasy sports betting website provides. Take a look! Once you register with the code, you will receive five free tournament entries. If you manage to win money from those tournaments, it will be allocated to your balance as Bonus Cash. There is a nice little referral program on the site where you can get the additional $50 for every friend that you invite to the website and that starts participating in the activities of this platform. Before we begin discussing the available sports for betting, you need to understand the principle used on this site. Once you register with the SportChamps referral code, you will be able to pay your entry fees for the tournaments. The process includes you entering the tournament and receiving a fictional 10,000 units of what they call ChampCash that you can use for making bets within the tournament. Every tournament has a table where players are ordered according to the success of bets. If you manage to get to the top 40, you will take a slice of the prize pool that was created by the players who paid the initial fee to enter the tournament. Now, the fees of these tournaments may differ a lot, and you can go as low as $2.5 entry fee to $100. If you are a big player, this means that you should not expect to win great prizes – at least not yet, since the website is fairly new and they have big plans for the future. On the other hand, if you are completely new to this type of betting (which is a rather unique fantasy betting type), you are bound to have a great time and learn more about the way it works and about sports betting in general. Once you are on the pay list, it means that you can exchange your ChampCash back for your dollars and later withdraw the money you earned. Now that the things are clear – take a look at the available sports on SportChamps – NBA, Soccer, NRL, AFL, Super Rugby, Horse Racing, and many others. Of course, the most attention is paid to the sports mentioned above as they are usually the most popular sports in Australia. As you could see, the format of the whole platform is a bit different, and it means that no live betting or live coverage is available at the moment. Nevertheless, they probably plan to incorporate it somehow in the future, but since they are young, this service is still unavailable. 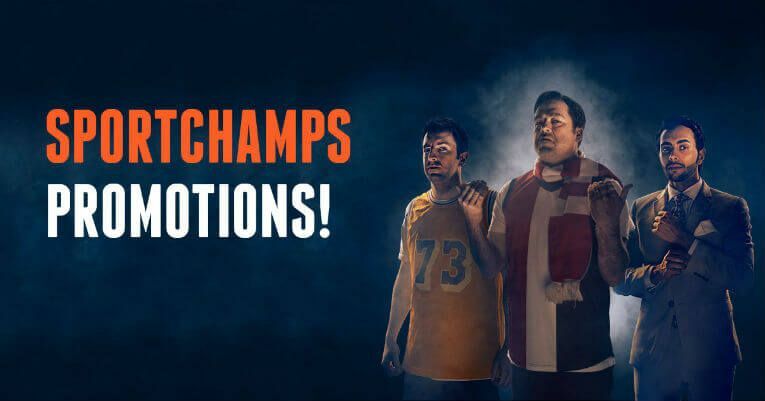 However, SportChamps still has a cool option that is entirely unique to this platform and can bring you the thrill and suspense that live betting has – a Private Tournament. This feature allows you to create a tournament of your own where you can invite your friends (or enemies) and compete with them. You can either play it for real money or not – either way, the platform will take no commission for it. The best thing about it is – you get to make the rules. The most genuine way to do it is simply to clone some of the existing tournaments and its rules. Choose an exciting name for it and invite your mates – and you are ready to play. Make sure to set an entry fee and make the whole thing more interesting. These groups are hidden, and only you and the members that you invited can see it on the platform. The team behind this unique betting platform certainly did not leave anything to chance. It means that they wanted to cover both Android and iOS devices with a great app that brings the entire experience to the small screens. The overall app interface is great, and you can download it via Google Play and App Store. It comes with all of the features that are on the website and is perfect for people who like to bet on the go. As soon as you download it, you will see that it is beginner-friendly and that every single detail is polished. You can easily navigate through the tournaments and pick your favourites in seconds. New platforms often lack a lot in some aspects, and this one lacks in adequate payment options. For now, the only two options you can use are a Credit Card and Bank Transfer. Credit cards are instant, but if you opt for the latter service, you might have to wait a couple of days before your deposit or withdrawal is processed. We hope that they will include other payment methods soon, as these two significantly limit the number of people who would want to use this service. They usually respond within minutes on live chat and within a couple of hours via Email. However, before you contact them, make sure to check their FAQ. It is a very well organised and deals with almost all the essential questions that the new users may have regarding the platform. Furthermore, there is a convenient search option where you can type in the key terms and get the suggested questions from the FAQ. SportChamps is unique. No similar platform currently exists on the web, and it is too bad that only the players from Australia can experience the amazing feeling that tournament betting gives. The website is perfect for new users as it is still young and does not allow for big bets. Although it lacks some basic stuff such as more payment methods and live streaming, it compensates for the unique ideas and great promos. Use the SportChamps referral code and claim the bonuses right away! Take a look at these frequently asked questions regarding the bonus code. Is there a SportChamps referral code currently available? Yes, there is. You can claim it via this article and receive the bonuses offered by this platform. It is a 100% welcome offer up to $50. Anyone who is of legal age and currently resides in Australia. Only one account per person is allowed, and people who make additional accounts are not eligible for the bonus. No, but you can still claim the welcome bonus using the fantastic app that is available on Google Play and App Store. For the most part, the bonuses cannot be mixed, but make sure to check on the website whether you can combine the offers. I can’t seem to obtain the SportChamps referral Code, what should I do? Make sure to go back to the beginning of this article and see whether you followed each step correctly. If you still cannot get the bonus, feel free to contact the extraordinary customer support offered by SportChamps and ask them for their assistance.